The richest 1% of Indians now own 58.4% of wealth | कृति मेरे मन की……. The share of the top 1% is up from 53% last year. In the last two years, the share of the top 1% has increased at a cracking pace, from 49% in 2014 to 58.4% in 2016. The accompanying Chart 1 has the details. Does that mean the trend of the very rich getting richer is because of the Modi government? Not really—as the chart shows, the share of the top 1% in the country’s total wealth improved from 40.3% in 2010 to 49% in 2014. But the numbers do suggest that the very rich are expanding their share at a faster clip now. The richest 10% of Indians haven’t done too shabbily either, increasing their share of the pie from 68.8% in 2010 to 80.7% by 2016. In sharp contrast, the bottom half of the Indian people own a mere 2.1% of the country’s wealth. 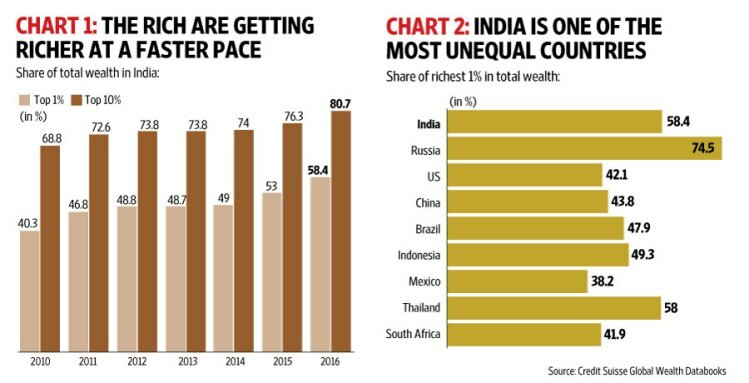 Data from Credit Suisse shows that India’s richest do well for themselves whichever government is in power. In 2000, for instance, the share of the richest 1% was a comparatively low 36.8% of the country’s wealth. In the last 16 years, they have increased their share from a bit more than a third to almost three-fifths of total wealth. Very clearly, most of the gains from the country’s high rate of economic growth have gone to them. How does India compare with other countries? Well, the Credit Suisse numbers confirm what we see on a daily basis—that India is one of the most unequal societies. Consider this: while the top 1% in India own 58.4% of the country’s wealth, the top 1% in China own 43.8%, in Indonesia they own 49.3%, in Brazil 47.9%, in South Africa 41.9%. Chart 2 has the details. But perhaps our richest need to try harder—the top 1% in kleptocratic Russia own 74.5% of the nation’s wealth.